We have attended exhibitions in Keswick, Carlisle, Kendal and Workington to provide information face to face. Copies of Prospectuses, Updates, books and other items are available from our exhibition stand or by mail order from our Carlisle address. We have no confirmed events at the moment. If we are unable to attend in person, we may put an advertisement in the programme or other publications. 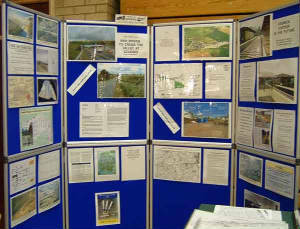 We have a display stand with printed material and some video presentations which we can bring to exhibitions or events. Slide shows can be arranged to explain the project in more detail. you would like us to attend. To invite us to an event, please use our "CONTACT US" page.